We searched for the seven most beautiful walks in the Pienza area. The Val d'Orcia is located north of Podere Santa Pia and is easily accessible either from the abbey of Sant'Antimo and Montalcino or along the western flank of Monte Amiata. Pienza is one of the most beautiful towns in Tuscany. The village, perched on a hill, is one of the most popular and most visited villages in the south of Tuscany, together with Montepulciano and Montalcino. In 1996, UNESCO declared the historic center of Pienza a World Heritage Site. In 2004, the whole Orcia valley was added to the list. Pienza has become very busy during weekends and during the summer months. But in April, May, and June, the ideal time for hiking in the Val d'Orcia, the crowds are not too bad. These walks start either at the Porta al Prato, the gateway to the old town, or in a more quiet part of Pienza, on the Via Enzo Mangiavacchi, where you can park well. 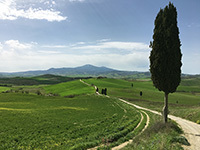 Between Pienza and Montalcino, the Orcia winds north of Monte Amiata through the hills of San Quirico d'Orcia, Castiglione d'Orcia and Radicofani. The artistic, natural and cultural park of the Val d'Orcia has created an extensive walking network, which leads you along unpaved roads, the so-called strade bianche, old cobbled paths, small churches and famous vineyards. Cypresses adorn the hilltops everywhere. We selected 7 beautiful and special hiking tours in the surroundings of Pienza, and seven trails in the area of the Vitaleta Chapel. A short exploratory walk along the streets of Pienza, along the Pieve di Corsignano and Via Santa Caterina. All streets in Pienza eventually lead to Piazza Pio II, a trapezoidal square, which optically provides a special perspective. Around the suggestive piazza are the four most important buildings of the city. The Diocesan museum has a fine collection of Sienese art, and the hanging garden of the Palazzo Piccolomini is exceptionally beautiful. We can park our car in the surroundings of Via Mario Mencatelli. A similar trail, with a different and shorter stretch in Pienza is the next walk, Annello Pienza - Capella di Vitaleta | 10,26 km. 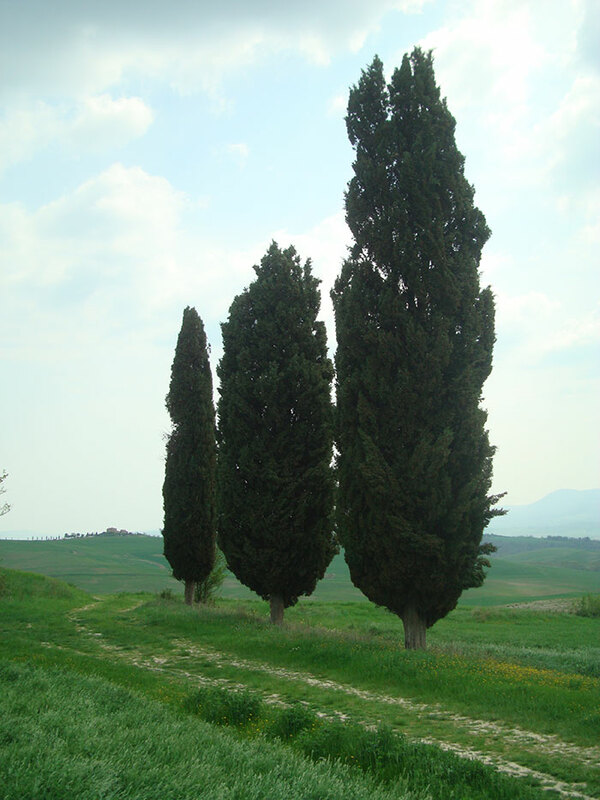 On the way back you walk along the famous road with cypress trees where some of Gladiator's scenes were recorded, and further along the Pieve di Corsignano, a jewel of Romanesque architecture. This itinerary starts at Piazza Pio II, the majestic central square of Pienza. We follow the Corso towards Porta del Ciglio, or we walk along the alley on the left of the Duomo, Via del Casello. There you have the opportunity for a first coffee with an uninterrupted view of the Val d'Orcia. (In Bar Il Casello, Via del Casello 3). This is a great place, visited by locals and young lovers. We leave Pienza via the Porta al Ciglio and walk along the Strada Comunale Monticchiello through the undulating landscape of the Val d'Orcia. This is one of the most evocative and unspoiled parts of Tuscany. We reach the gate of Monticchiello after about 1.5 hours. There are several good restaurants in Monticchiello, some with a beautiful terrace from where you can look back on the track. Montepulciano is built on a narrow tufa cliff. The long main street, the Via di Gracciano nel Corso, connects the Porta al Prato with the Piazza Grande. This square is built on the highest point of the ridge. Begin the walk on the Piazza Grande of Montepulciano, take the panoramic path to Porta dei Grassi, and continue walking down to the Chiesa di San Biagio. From there the path leads to Pienza through the typical hills of the Val d'Orcia. The landscape approaches the image that many people of Tuscany have, the Val d'Orcia with its rolling green hills, vineyards, idyllic villages on hill crests and everywhere the so typical cypresses. There is a variant of this hike that halfway also passes Monticchiello. This is a good alternative.